Joe's back. That's what a lot of Bucs fans were saying Sunday. Yes, the Bucs eased to a 35-3 rout against moribund San Francisco. But there was more. Joe's back. Back in the end zone for the first time in 14 months. Joe Jurevicius liked it so much he went there twice, doing a happy little dance. His knee felt fine. His back felt fine. The surgeries are behind him. All that work to get back. Fourteen months of sweat. Joe's back. It took so much to get back to the end zone, including a heart-to- heart with his head coach this week. Nothing Keyshawn-like. Just a guy three games into a comeback, champing at the bit. ``Don't forget me,'' Jurevicius told Jon Gruden. And Gruden didn't. Joe's back and he remembered everyone after he scored. There was the Air Force captain he handed the ball to after catching a 42- yarder from Brian Griese. It was for all the men and women who fight real fights. Jurevicius will paint his other touchdown ball pink for his 3- month-old girl, Caroline. And there's his fighter, his tiger, who in the 70 days of his life taught his father so much, ``I have an angel upstairs,'' Joe Jurevicius says. As usual, he wrote his little boy's first initial in the end zone grass before the game. M for Michael. In the end zone. Joe's back. 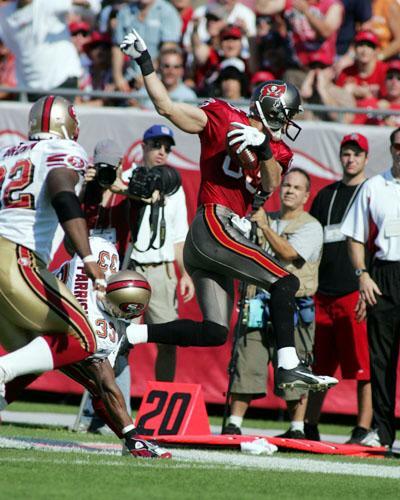 Joe Jurevicius has been an extraordinary ordinary Joe since he arrived in Tampa Bay. He's one of those Bucs fans won't ever forget. Parents talk to their children about Joe, about working hard and knowing what really matters. He fixed his spot in franchise history forever on Jan. 19, 2003 - his big catch and run against the Eagles in the NFC Championship Game. We all knew the story of Michael Jurevicius, born two days before the playoffs began, born very sick, born to fight, born to inspire. We were touched by them, the big man and the little boy and the Super Bowl they won together. Maybe that's why Jurevicius went to Gruden this week. He'd been back three games, but had just six catches. He hardly played at Atlanta. ``There was no lashing out,'' Jurevicius said. It was simple. Don't forget me. He caught five balls before halftime Sunday, all he needed. His third catch went for a score. On his fifth, Jurevicius was crunched, but held on in the end zone. Then he popped up and did something that guys like Joe do. It ended in the end zone. Joe's back.